Zinc air batteries are a type of metal-air batteries. These are of two types: The primary cell types, an example of which is the button cell, and the secondary (rechargeable) type. These batteries have high energy densities and are relatively inexpensive to produce in the non-rechargeable form. Sizes can range from very small button cells used in hearing aids to very huge batteries suitable for electric vehicles. Since zinc is being consumed and oxygen is obtained from the air, rechargeable operation is possible by physically replacing the zinc electrodes. The smaller button cells (non-rechargeable) are used in devices like watches, calculators, and hearing aids. Larger cells are used in remote location operation of warning lights, etc. 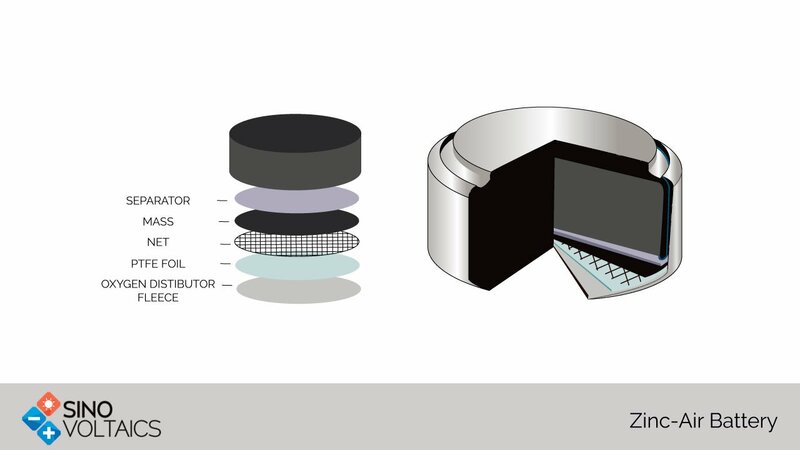 Zinc Air battery is being investigated as an electric vehicle battery and as large-scale energy storage. This battery is sensitive to humidity and temperature extremes. Carbon dioxide present in the air forms a carbonate which can reduce conductivity. The zinc air battery suffers from high self-discharge. Battery life is short as the chemical tends to dry out. Recharging is feasible only at large scales. Internal resistance is high which means limited current for given size.